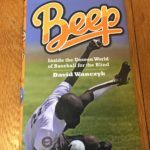 Baseball Hall of Fame Weekend – a Beep Baseball Bash! As a kid, I studied baseball cards and the baseball encyclopedia. I played Strat-o-Matic baseball and even played video games while keeping score and tracking my own fake stats. A baseball geek would be a way to describe my past present and surely my future. At one point in life, I could open to any page of the baseball encyclopedia and I could give information on at least one player from that page. 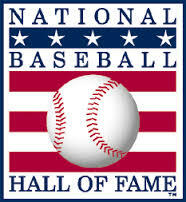 I could intelligently debate with anyone about the merits of a player making the Baseball Hall of Fame. I was serious about this! It helped me collect baseball cards of players who I thought would be good investments. After all, in the 80’s, I had cards worth over $500 each with this research (and luck). My baseball career started off great. Early in my little league career the coaches voted me to all-star teams in Farm and Minor Leagues as a first-baseman who could jump and get all the bad throws from young kids. As I got a little bigger, my game seemed to peek. When I was 13, my heart broke when I received the news I was cut from the team. That experience made me work harder. I never got cut again from travel ball. Getting on base and playing with heart was my ticket to making the team. Learning to play other positions also helped make me a more marketable player. Hitting never came easy. As I know now, my mechanics were long. However, I peppered the parking lots with foul balls and drew walks. Sadly. I could not make my Junior High team or my High School team. My Hall of Fame dreams were over….so I thought. In 2013, a documentary I starred in played at the Baseball Hall of Fame Film Festival and holy crap, did that feel amazing. People came to watch a film about our team. People stopped us to talk about the film all weekend. I felt like we had accomplished something special. We had helped a lot of people along the way. On the way home from the 2015 World Series in Rochester, the Hall asked us stop to do a presentation. Personally, it was bittersweet. Just the day before, while sitting at the Championship game, I got a call that will live with me forever. My dad was unconscious in an ambulance. He passed away before making it to the hospital. As a young boy, my dad told me stories of his professional baseball career. I only half believed him. After all, most kids idolize their dad and who would think they would lie to them, at the age of like 7 or 8. This story got real for me in school. I told my friend, Bob Sundberg this story of my dad’s baseball career. With energy and clarity, Bob quickly claimed he thought he had my dad’s baseball card. This suddenly seemed real to me. 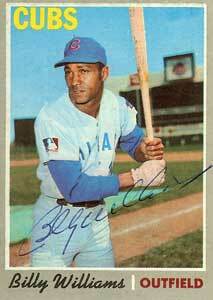 After a short time, we discovered this card was not Bill Weissman, but soon to be hall of famer, Billy Williams. A joke from my dad turned into anxious excitement from this kid. It was even funnier that this story lived on for so long till we actually found the baseball card. Seeing Bobby Doerr get inducted as part of the class of 1986 with my father was memorable. It was exciting to see a Red Sox get into the Hall. The flight home may have been more memorable My dad was a pilot in those days and flew a small 4 seater Cesna with one propeller. Flying home, we hit major storms with lightning screaming by our plane. The turbulence were so bad, my head hit the ceiling before I buckled in. If you think flying is scary, you would not have survived that flight. Back to 2015 – As I sat and watched Bryan Grillo and Guy Zuccarello talk to the Hall of Fame crowd. I sat with pride in what we have done. I had hopes my dad was watching. It was exciting to give these two giant baseball fans the chance to feel what I felt in 2013. Bryan and Guy deserved to have their own Hall of Fame moments. I also had a chance to help someone I did not know from Texas. Brandon Chesser, of the Austin Blackhawks was with us because I helped get his name into the Hall of Fame. His shirt, gloves, blindfold and picture were on display at the Hall of Fame. How cool was it that I helped make a dream come true for him? In 2017, I went back to Cooperstown and donated a Renegade’s bat used by Christian Thaxton. Thax had set a league record, batting .897 at the World Series. Cooperstown wanted his bat. I brought this bat in person to the Baseball Hall of Fame Film festival. 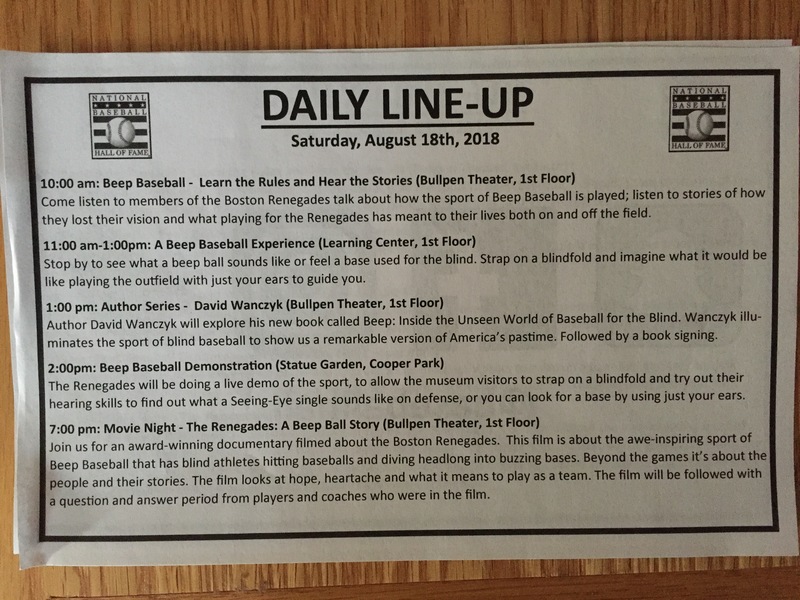 The same festival we appeared in during the fall of 2013. I handed the bat to Shirley Tyler with beaming pride. Shirley and I spoke and she wanted to do a program with our team. The seed was planted. While at this film festival, I learned of an Author Series. I quickly reached out to David Wanczyk to gauge his interest. It was off the charts! Of course, at this time, his book was not done. Our trip to the Hall in 2018! As the calendar changed to 2018, Dave’s book was becoming a reality. It debuted in April, just as the buys of summer were coming back from Spring Training. Shortly after there, Wanzcyk told me his book was accepted to the Author Series. I was on the phone with Shirley Tyler. 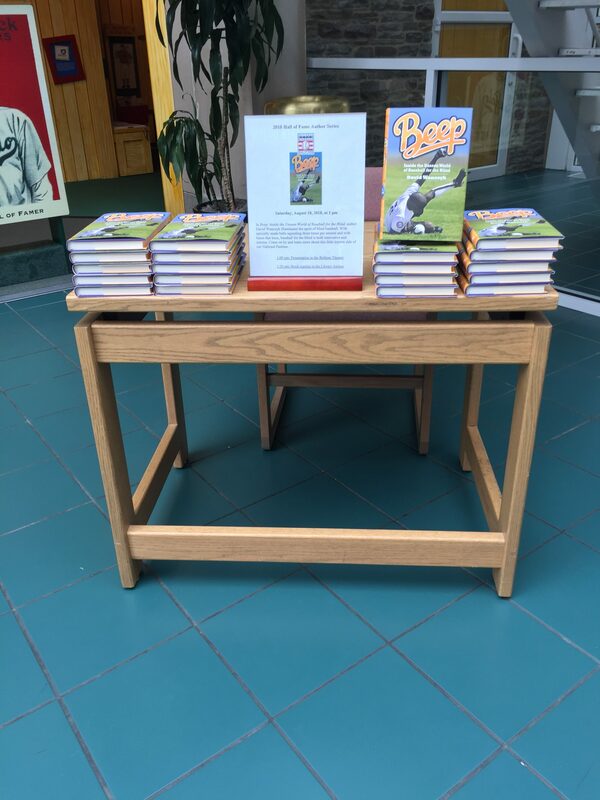 We developed a program to tie that Author series into a day of beep baseball at the Hall of Fame! I wrote a lot about this program in the summer and won‘t rehash it. Instead, let me talk about the experience. When the chips fell, ten Renegades made the trek. Joe Yee likes baseball, he can’t tell you stats, but likes the game. He likes adventures even more and this was an adventure for him. Rob Thayer missed the 2018 World Series due to an injury that could have resulted in the loss of a toe. There wasn’t anything stopping him from making this trip. Rookie, David Sanchez is possibly the biggest baseball fan amongst the players and was excited to see the Hall for the first time. Christian Thaxton played junior college baseball and was motivated to go as his bat was now in Cooperstown. forward to going to this baseball mecca with guys I grew up playing with. Bryan Grillo was also with us, my partner in crime with Red Sox season tickets and one of the fathers of beep baseball in the New England area. On the other hand, Hunter and Teigan Weissman came along as well. What a thrill it was to take my nephews. They are both big baseball fans and I was anxious to show them things I knew they had never known. We also got some help from the Rochester Pioneers. Since they are the closest team to the Hall, I invited them. Coach Mike Fisher and player Helen Jones came down to participate. Also in attendance was the NBBA PR chair, Darnell Booker. He brought with him NBBA lifer and current San Antonio Jet, Dave Benney. These self-proclaimed baseball junkies had never been to the Hall and were so excited to be a part of it. I was so happy to get some help, and to give them an opportunity to feel as special as I did in 2013. Here were my personal goals for the weekend. I wanted everyone who came to have a part in the program and to feel special. I wanted to share this time with my friends and my nephews and give my nephews a time they would never forget. Getting to see Christian Thaxton experience seeing his bat in Cooperstown would be amazing. Anyone who knows me or sees me volunteering for the Renegades knows I go into project management mode. I get in the zone. It’s a pure mix of adrenaline and excitement mixed with a desire to market the sport and grow our team’s resources. I always have an eye to the future hoped this could help us in many ways tell our story. Over the past few years I have learned this “mode” brings me stress. I need to breathe. I promised myself to have mindful moments. and to sit back and enjoy what others were doing. The day started off with my nephews and I lugging equipment to the Hall’s loading dock. Like a little kid, I was so excited to be able to see the back halls of this legendary place. Heck, I was more excited than Hunter and Teigan. We met up with Shirley soon at the learning center. While there, she got us some help to set up the room. She also handed me little placards they made for us. Let me back track. A week before the trip, I started to come up with ideas of what we could show in the learning center. I pulled from my talks with museum curator, Tom shieber in 2014. He told me how they tell a story through artifacts. Late at night, I would hammer out small stories about our artifacts. On this day, my little notes, came to life with Hall of Fame placards! Leading off: Grillo, Thaxton and Yee! Batting Second: Learning Center what a show! Something meaningful happened here for me. The desk brought out for Dave to autograph his book on was familiar. My father owned a furniture manufacturing business in Fitchburg, Mass. In 1994, he bought a company from upstate, New York called Library Bureau. In fact, I worked for this company till 2000. Dave’s novels were neatly stacked on one of his tables from the Tecktonic line. Not only are some of these pages telling stories of our squad and things I may have said, it also had a touching tribute to my late father. 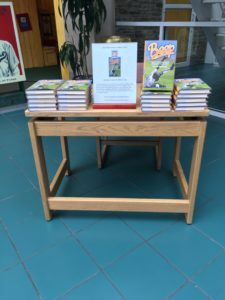 Wow, this book, on his table in Cooperstown! Chills went through my body. In some Devine way, my dad was connected to this proud moment of my life. Two patrons who fell in love with our sport kindly asked me for my autograph. Wow, who am I to autograph a book in the Hall of Fame? What an honor that was, I just hope people could read my handwriting. Batting fourth – Come try the game! While this was going on, we had re-opened the learning center as a way to feed people to the demo. We probably kept this center open 90 minutes longer than planned due to the feedback and excitement from people who came into the room. After the demo was over, eventually, Christian Thaxton, Ron Cochran and I went to the second floor to see Christian’s bat on display. I will write more about that experience in another blog because that was totally mind-blowing for me. The amazing program wrapped up at 7:00 with a showing of our documentary. I wish I could say the theater was full of eager Beepball fans. Sadly, the only people there were the beep ballers. Shirley had set my expectations this could happen because the museum was still open. If you have ever been to the bullpen theater here, it’s not in the most central location. It’s very off to the side, but is a hidden treasure of the Hall! Sitting there, watching the film I had to sit and be mindful. 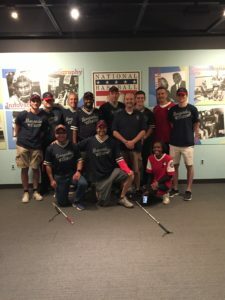 “Our story is in Cooperstown playing in a theater!” We spent an entire day bringing this sport, its stories and our players to baseball fans from around the country. I’m not sure I could ever have dreamt this up. As I sat and narrated this movie to Dave Benney, I saw how young I looked in 2005. I saw how raw of a coach I was. High strung was surely a word to describe me. The passion I have today burned so bright in those days of 2005. Memories of the Billy Williams moment came to mind. I thought of all those baseball games I played with Ron Cochran and Jason Lenicheck in the 80’s raced past my eyes. I just could not believe my dream of being in the major leagues had turned to this. 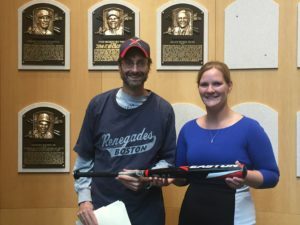 I’m a coach of a baseball team for the blind with my friends and family. We have helped change people’s lives and brought people together. We were sitting in the National baseball Hall of fame and I’m beaming with pride, holding back tears of joy. I’m one proud coach at this moment. Though we are not hall of famers, we have a movie and now a book and a bat in the hall of fame. Wow! Rob, what an amazing day for the Renegades and the game of beep baseball. So grateful you had the opportunity to celebrate the accolades of your players and the history of this sport. 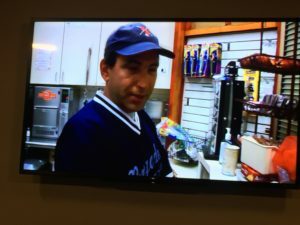 You’re a great ambassador – and this was a wonderful recap. I love your style of storytelling! BTW, I’d love to get a copy of your documentary. Can I get one from you? Thanks for the Love @Romack. I am not a writer, but I’m improving. Most importantly, I want to pay honor to some people and have the memory forever. Maybe some day in the future, we will look back at this and relive some great moments. I also hoped that people may enjoy reading it. I’m happy you did! Disregard my question about the documentary… had never seen the link to buy it until just now. Snagging a copy right now. Man, I love all the info and resources you have on the site. This is such a great piece of writing. Brings me right into your life. 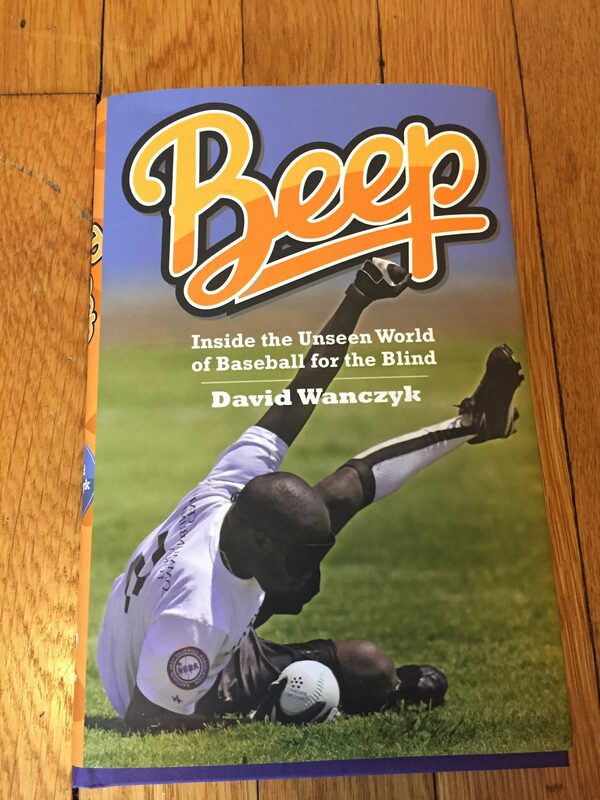 Explains why you are so amazingly passionate about baseball and beepball. And of course the description of your life, a baseball life, with your Dad is powerful. Glad to have been a part of this Renegade history. The players and coaches who play and support this sport, that I have met, are all damn good people. @jack, thanks for taking the time to write in. Your help in 2005 helped make all of this possible. Without the efforts of you and Liz, we never had the connections that we have made. Without that film, we probably never had this event. So a HUGE thank you for all you have done for us! Rob, great summary! Thanks again for inviting the Pioneers!